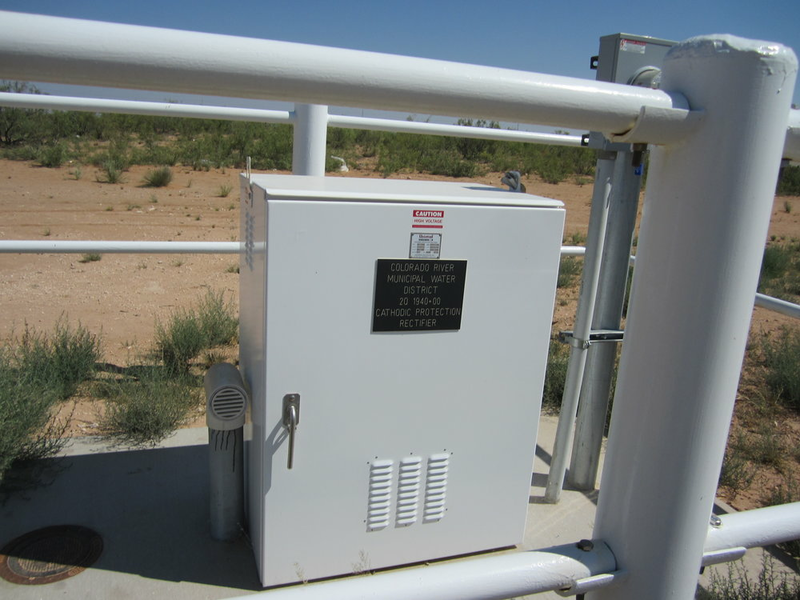 Colorado River Municipal Water District Cathodic Protection — V&A Consulting Engineers, Inc.
V&A designed an impressed current cathodic protection system for the Ward County Transmission Pipeline located in the Midland/Odessa area of West Texas. The pipeline is approximately 41 miles in length and transports water from a base station to a terminal storage reservoir. CRMWD’s Ward County Transmission Pipeline runs from a base station to a terminal storage reservoir and is 41 miles in length. For construction purposes, the pipeline was divided into two contracts referred to as 1) Contract A – comprised of 20.9 miles of 48-inch polyurethane coated steel pipe, and 2) Contract B – comprised of 20.1 miles of 48-inch and 42-inch bar-wrapped concrete cylinder pipe. Each of the “contracts” is protected from corrosion by an impressed current CP system featuring multiple air-cooled rectifiers. Contract A features two rectifiers and Contract B includes ten. The Ward County Transmission Pipeline was installed parallel to an existing 33-inch bar-wrapped concrete cylinder pipeline (BWCCP). Soil analysis performed along the alignment of the 33-inch pipe determined that an 8-mile section of the pipeline was installed in soil with a level of corrosivity that warranted the installation of cathodic protection. This 8-mile section of the 33-inch pipe is located adjacent to Contract B. Originally, this 8-mile section was intended to have a separate impressed current CP system. Theoretical calculations determined that once the CP system for Contract B was activated and the pipeline had polarized, sufficient capacity would remain to provide CP current to this 8-mile section as well. V&A completed the activation and evaluation of the newly-installed cathodic protection. V&A performed an evaluation confirming electrical continuity of the pipeline, tested the performance of impressed current CP systems, and adjusted the output of the rectifiers ensuring the pipeline met the National Association of Corrosion Engineers (NACE) criteria for adequate corrosion protection. CP system assessments were conducted and continuity testing was performed on Contracts A and B using the “attenuation” method, all rectifiers were activated and adjusted, and an initial pipe-to-soil potential survey was performed on Contract A. Both Contracts were given approximately one month to polarize. A second pipe-to-soil potential survey was performed, which lead to adjustments and then the 8-mile section was bonded into the BWCCP pipeline—the District received two for the price of one. Technical Paper, Corrosion Control of Paralleling Bar-wrapped Concrete Cylinder Pipelines utilizing an Existing Cathodic Protection System—Two for the Price of One, presented by Jose L. Villalobos, PE & Matt Snow, EIT at the ASCE Pipeline Conference in Kansas City, July 20, 2016 is available here.